Before the fashion statements of hippies, punks, or hip-hop, there was the zoot suit, a striking urban look of the World War II era that captivated the imagination. Created by poor African American men and obscure tailors, the "drape shape" was embraced by Mexican American pachucos, working-class youth, entertainers, and swing dancers, yet condemned by the U.S. government as wasteful and unpatriotic in a time of war. The fashion became notorious when it appeared to trigger violence and disorder in Los Angeles in 1943-events forever known as the "zoot suit riot." 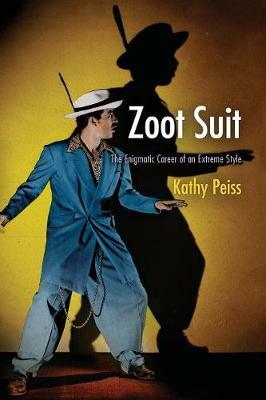 In its wake, social scientists, psychiatrists, journalists, and politicians all tried to explain the riddle of the zoot suit, transforming it into a multifaceted symbol: to some, a sign of social deviance and psychological disturbance, to others, a gesture of resistance against racial prejudice and discrimination. As controversy swirled at home, young men in other places-French zazous, South African tsotsi, Trinidadian saga boys, and Russian stiliagi-made the American zoot suit their own. In Zoot Suit, historian Kathy Peiss explores this extreme fashion and its mysterious career during World War II and after, as it spread from Harlem across the United States and around the world. She traces the unfolding history of this style and its importance to the youth who adopted it as their uniform, and at the same time considers the way public figures, experts, political activists, and historians have interpreted it. This outre style was a turning point in the way we understand the meaning of clothing as an expression of social conditions and power relations. Zoot Suit offers a new perspective on youth culture and the politics of style, tracing the seam between fashion and social action.